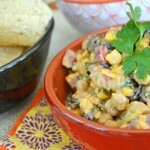 Cowboy Caviar is a hearty, healthy and delicious appetizer! Feeds a crowd too! Serve it with tortilla chips, fresh salsa and cilantro. So good. Let sit for at least one hour in fridge before serving. You can serve it right away, but if you let it rest, the flavours all come together so nicely! Serve and enjoy with tortilla chips! If you don’t want to make your own taco seasoning, you can just use a premixed package of taco seasoning. Just omit any extra salt that you might add. You can make this recipe a day ahead.